How Lou Sees It: Hop on the Magic School Bus! 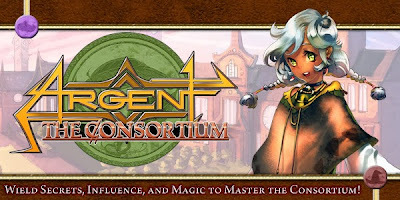 Argent: The Consortium, one of my current Featured Kickstarters, has less than 14 hours left and I had the great opportunity to ask Brad, the founder and president of the game's publisher a few questions. I for one am very excited about this game. Thanks Brad for taking the time to answer just a few questions. The project is doing so well and it has almost reached its final posted stretch goal. Congratulations! Let's start into the questions. Q - I am very excited about the theme of this game. As I first read about the theme of Argent I personally thought about my growing up years reading Harry Potter and most recently The Rithmatist by Brandon Sanderson. What was the inspiration for the theme and did the theme come before, during, or after the actual game design? 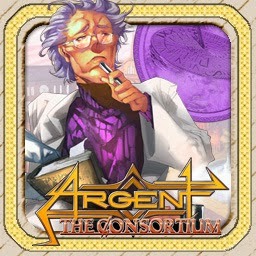 Q - What one word would best describe Argent? Vivid. The game really leaps to life, despite the stereotype of Euro mechanics. Everything you do feels like part of a vast conspiracy. Q - If you were one of the professors or students at the school, what department would you be in? My trade skill is computer science, so I'd probably be in the Department of Planar Studies. 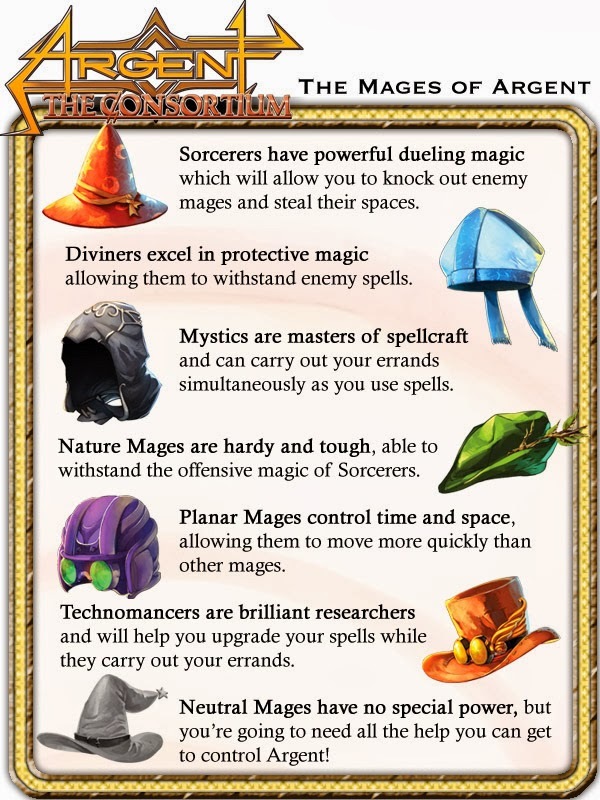 Q - The game comes with so many goodies and I love that you already have an expansion ready too. How much will this thing end up weighing? We're looking at 6 pounds, probably 7 with the Kickstarter bonus content we're planning (Summer Break). Q - This game is chalked full of really interesting game mechanics and components. Name and discuss 3 of your favorite components or game mechanics that set Argent apart from other games. 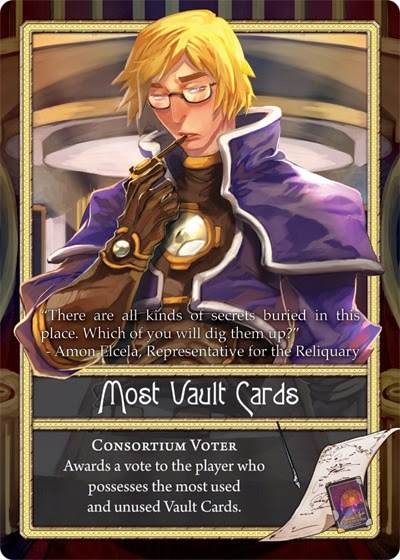 1 - Secret Voters are the biggest one. Not knowing the victory conditions unless you do your homework, and not having VP as a pure gauge of progress is really refreshing. 2 - Spells are pretty huge. Having a tool belt of different powers and capabilities that will change in each game means that you have to adapt new strategies by what you have at your disposal. 3 - Variable Time Rounds really add pressure. In Worker placement games with removal, you usually play Chicken to see who will take the high-value spot first and get zapped. 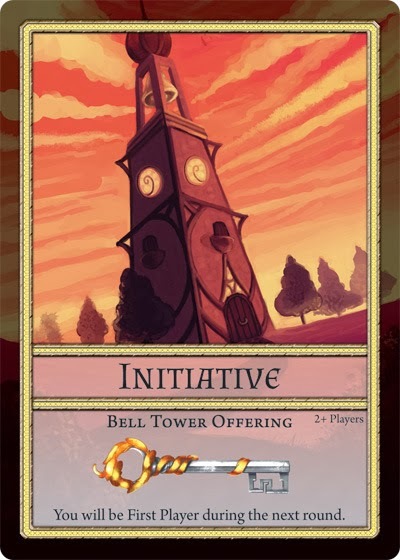 However, in Argent, the Bell Tower mechanic makes rounds end early, and means that you often have to seize opportunity while you can, or you won't get anything. Q - Replay ability is a big factor for me and your Pixel Tactics games did such a great job providing huge playing variation that keeps each game fresh and always offering something new each time it's played. Does Argent have that same level of replay ability or more in your opinion? I'd say Argent has more total variations, though two matches of Pixel Tactics probably feel more different than two games of Argent. With large games, you have to make sure the baseline is solid across multiple plays, so that skill and strategy have room to develop. But no two games will ever be quite alike! Q - I really can't wait to see and play the final product, I think it is going to be epic. I really am in awe of this game and I can't stop thinking about it. It is doing so many things right. Any suggestions on what to do to pass the time between now and June? Play BattleCON: Devastation! It'll be at your FLGS by the end of January! I know many are excited for Argent to come out this year and can hardly wait, but playing Pixel Tactics or BattleCON as we wait doesn't sound half bad! 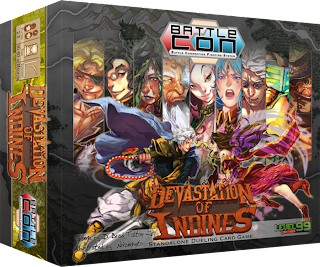 I hope to be able to provide you all with a review of Battle CON: Devastation! soon and I should be able to provide you all with a review of the final game come summer time when the final game is released. If you are interested in backing Argent on Kickstarter, you may only have minutes left! If you miss it, I'm sure you will be able to get a copy eventually, but why miss out on the great Kickstarter rewards and that is How Lou Sees It.